Determining the qualification of your surgeon is one of the most important undertakings of a patient. While it may take a little time, it is important to take a few minutes to prepare a few questions for your doctor. You should feel confident in asking the doctor about his training and experience. 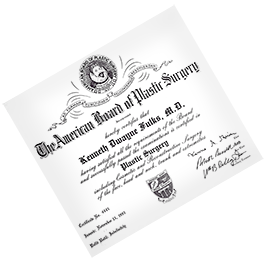 Dr. Fulks is Board Certified in the Specialty of Plastic Surgery and is a diplomat of the American Board of Plastic Surgery. He has been in practice as the only Board Certified Plastic Surgeon in the Southern Middle Tennessee area. Patients must be careful in their evaluation since many physicians will use the term board certified but are NOT Plastic Surgeons and have had no formal training in the specialty. There is NOT a board of cosmetic surgery and terms such as this are clearly designed to deceive patients. Dr. Fulks is proud of his training and years of experience and welcomes your inquiries about his training and board certification.